Are you struggling to cope with all the stress in your life? mindfulness can help! Is the overload of priorities getting to you? Do you feel anxious about the future? Develop a mindfulness practice that suits your lifestyle and which enables you to remain calm, stay focused and make the best decisions in any situation! 6 x two-hour modules: each module features a particular practical application of mindfulness. THE PRACTICAL MINDFULNESSTM PROGRAM was developed jointly by clinical psychologist and Cognitive Behavioural Therapy (CBT) specialist Dr Colinda Linde, and high-performance life and executive coach Neil Bierbaum. COLINDA has been a clinical psychologist since 1993 and is the current chairperson of SADAG. 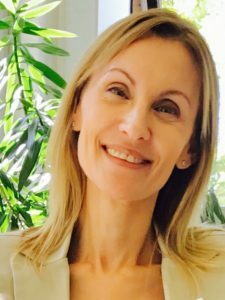 She specialises in CBT for anxiety disorders (panic, social phobia), and works extensively in the areas of stress management, work-life balance, sleep issues, assertion and mindfulness. Colinda also practises and teaches meditation and founded the self-help CBT website thoughtsfirst.com. 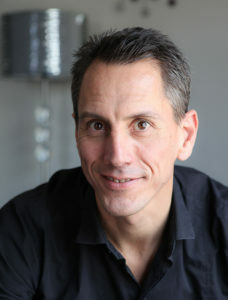 NEIL has been a life and executive coach since 2005 and has practised and taught meditation for more than 20 years. 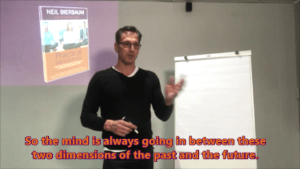 He has worked with large corporates, SMEs, entrepreneurs and private clients – many of them looking to manage the enormous stress and increasing complexity in their work and personal lives and make sure they achieve their potential in an uncertain world. Get the Sensation Meditation download. If you already know that you’re going to complete the series once you have attended Module 1, then book now for the full package that includes Module 1. You’ll get one module free and save R350! NOTE Modules 2-6 will only be available to book as a package. 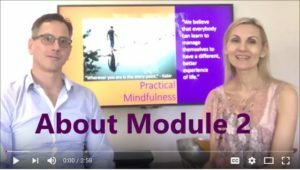 We will not accept bookings for individual modules, except for Module 1. Get the Breathing Meditation download. 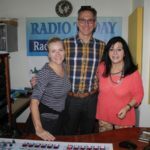 on Radio Today (13 Sept 2017). In the video below, Practical Mindfulness co-founder Dr Colinda Linde talks about the ways in which Cognitive Behavioural Therapy, and the school of Behaviourism in general, has recognised and embraced mindfulness as a key enhancer to its own processes. Our corporate program consists of a series of six two-hour nano-sessions, run fortnightly, for groups of 25-40 at a time. A white-labelled version of the online program is available on a subscription basis. Contact us for a password to gain access to the demo page.